System.InvalidOperationException: Values must be bound to a non-null expression before ForEach activity 'ForEach<DynamicValue>' can be used. 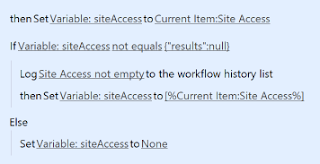 Where in Step 1 I'm using Current Item:Site Access As String, and inside the if statement I'm using the Current Item:Site Access as Lookup Values, Comma Delimited. THANK YOU THANK YOU THANK YOU!!!! Worked for me.